← What to demand from an incoherent, mood changing president wannabe? A born Bolivian struggling under Trump’s stupidity! I can only imagine the stress of Nicolle Uria and her family … Bolivian parents try to give their best to their children, we are very caring and loving … sometimes we need to abandon our country as there are no jobs, no conditions to match our children’s needs for a better future than what we could give them in Bolivia. Had we stayed, we would have to align with the political party in power in order to get a decent paid job; education and health are not good as well as it is difficult to get a job with our skills as we have no proper “connections” … so we end up living under a different culture, and our children embrace it and are also proud of their reality. Many of us ended in Argentina, Brazil, Europe and the USA … sad to see that a delusional egomaniac like the one we have currently as president of the Nation has this outrageous “policy.” Evo like Trump are no more than egocentric individuals who have no real connection with their people. They are just a pair of demagogue jerks. I just hope Nicolle and many like her, remain in the USA, despite Trump’s stupidity! The above opinion is from Bolivian Thoughts. 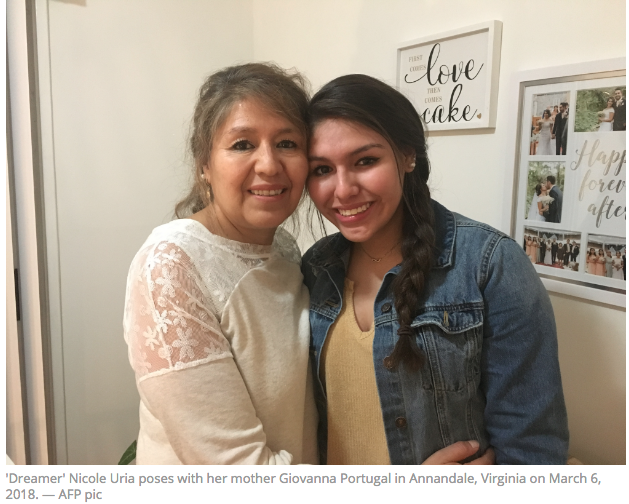 ANNANDALE (Virginia), March 14 — Nicolle Uria was 15 when her parents told her a shocking secret: she was an undocumented immigrant in the only country she has even known. The teen, who was born in Bolivia, recalls that as her parents braced her two years ago for that gut-wrenching conversation, she expected something else to come out of their mouths. “I immediately thought, ‘I’m adopted’, even though I look just like my sisters and my mom,” Uria told AFP. “The last thing on my mind was finding out that I was undocumented,” said Uria, who is in her last year of high school in Annandale, Virginia outside Washington, and says she wants to study journalism in college. She gets good grades, is on the school volleyball team and works on the school newspaper. But she is now worried that her dreams will go unrealised. Last September, her life was turned upside down when President Donald Trump ordered an end to Deferred Action for Childhood Arrivals (DACA), the Obama-era programme that protected from deportation some 700,000 immigrants brought to the US illegally as children, as she was. Trump gave Congress six months to work out something for these so-called “Dreamers,” most of them Latinos. The programme was supposed to end on March 5 but remains in force because of rulings from two federal judges suspending Trump’s decision. While the programme works its way through court and lawmakers have failed to agree on the fate of the “Dreamers,” Nicolle is terribly afraid of being separated from her parents, siblings and other family members. Nicolle’s parents brought her to America when she was a year old. Ivan Uria, a former civil servant, and Giovanna Portugal, who studied to be an architect, worked in whatever they could find: cleaning homes or offices, at a gas station, looking after small children. Their overriding goal was to get a good education for their three daughters. They always led Nicolle to believe she had been born in the United States. “I did not want to break her heart telling her the truth,” said Portugal. One time, Portugal asked her daughter’s Girl Scout leader to leave her out of a trip to the White House by telling her there was no room — she could not bear to tell Nicolle she did not have the papers needed to get into the presidential mansion. Portugal and her husband recently obtained residency papers after their elder daughters — Ariana, 31, and, Lizzet, 29, both university graduates — married US citizens. But legalizing Nicolle’s status is tricky, and they are acutely afraid of her being deported. “I just don’t want to go back because I’d feel that I wasted my parents’ time. My parents have worked so much,” Nicolle said. She thought of her parents when she attended Trump’s State of the Union speech at the invitation of a Democratic lawmaker, and once again heard the president speak of immigrants as if they were criminals. “I would like him and the members of Congress to think of us as their kids. I know that they want the best for their kids. And we are here to give a better future to America,” said Nicolle. Once she knew the truth, Nicolle was not shy about telling the truth. But it was not easy. On social media, she got threatening messages that told her to go home, or that immigration agents would be sent to her house, or that her parents should be arrested. One teacher even told her he trusted Trump would build his promised wall on the border with Mexico. Uria said it was a joke but it still stung. Nicolle’s real friends say they could not be prouder of her and that she is the first “Dreamer” they have met. “When she told me her story, it was the first time I heard about DACA,” said Jessica Roop, who has played volleyball with Uria for the past four years. Nicolle began to feel she was doing the right thing when kids at school who had grown up without papers would stop her in the hall and thank her. This entry was posted in Bolivia, Social Unrest and tagged human rights, immigrant. Bookmark the permalink.